Natural Gas Conversion Kit: Select for Options Yes, I would like a NG conversion kit. No, I do not want a conversion kit. 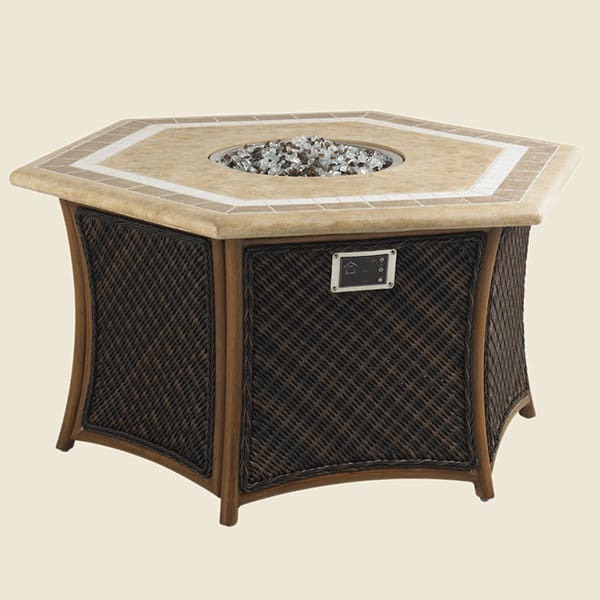 The Island Estate Lanai Fire Pit is certainly one with the Island Estate Lanai furniture offering, with a strong woven wicker base and a Sandstone-colored Weatherstone tabletop. It is flexible, though, and may act as a welcome addition to any other furniture set on the planet. The Island Estate Lanai Fire Pit is made to run on liquid propane, but a natural gas conversion kit is readily available. The base features a door that swings open to show ample storage space, ideal for housing fire pit accessories and a propane tank. The flames are engaged with a push-button ignition, and the flames and heat are controlled with a 3-level flame controller. Real flames dance atop a bed of fashionable fire glass rocks, providing visual interest and heat as desired, and then they disappear with the flick of a switch. You and yours may enjoy the maintenance-free, easygoing use of the outdoor fire pit by Tommy Bahama.